The UMass College of Engineering is a haven of opportunity for companies on many different levels. First, there are ongoing ventures to engage with our faculty, who are doing state-of-the-art research to upgrade numerous technologies that industries require. Our students represent the engineering labor force of the future, and several career fairs provide companies with the chance to recruit our best and brightest engineering graduates. 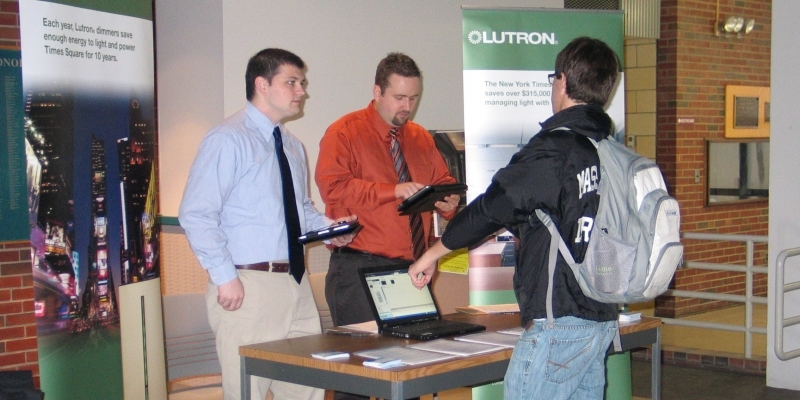 Our Engineering Career and Student Development Center gives many companies the opportunity to enlist interns and permanent employees, while the center’s Corporate Partnership Program presents organizations with multiple resources to promote their brand, stage information sessions, and engage with students and faculty while on the UMass Amherst campus. The college’s senior capstone design courses hand industries a fine opening to sponsor creative projects, thus rounding out the education of up-and-coming engineers, and even developing key technologies for the corporate research and development process. Beyond those prospects, many companies choose to fund college research, facilities, programs, coursework, scholarships, professorships, and other college areas that specifically benefit companies and their products.